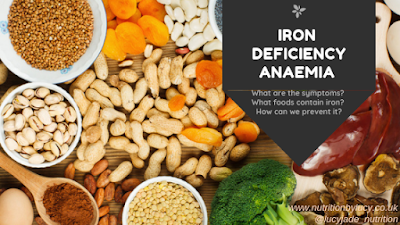 Iron deficiency anaemia (IDA) occurs when there is a lack of iron in the blood. This leads your body to struggle to create enough red blood cells to be able to transport blood around the body. This lack of oxygen contributes to the feeling of tiredness and lethargy. If you think that you have any of these symptoms, then it's really important for you to go to your GP and they can arrange for a blood test to look at your full blood count; basically, see what your red blood cell count is. They will also try to find out what the cause of the IDA is; for example, heavy periods, colitis, piles or an ulcer. How can I treat Iron Deficiency Anaemia? When you have been to the doctor and they have been able to confirm that you have IDA, then you can start taking steps to treat it. Doctors will more than likely prescribe you some iron supplement tablets, these should be taken with food or after a meal to help calm down some of the common side effects. Iron needs vitamin C with it to be absorbed properly into the body. So if you can drink a small glass of orange juice, eat some red peppers, broccoli, or if you are buying your own iron tablets then get the ones with a multivitamin included making it easier. Can I do anything with my diet to help get more iron? Caffeine - caffeine has been shown in studies to inhibit the amount of iron that is absorbed so try to limit this as much as possible. If you have any other questions about Iron Deficiency, then please ask me either using the contact box below.